Yes, I admit this is a repeat photo card from last year. However, even if I AM prejudiced, I just melt whenever I see this photo. That's my puppy! Yes, yes, she'll be three in February, but she'll ALWAYS be our puppy! Your puppy is a cutie! Stay safe and warm during your winter storm. Stay warm! We have rain today, sad that it is melting our snow from last week! What a lovely dog, great photo. That is definitely a sweet photo! What a lovely pooch she is! I haven't seen it before Misty and it is a beautiful card. Your puppy will always be your puppy. She is adorable! Stay safe & Warm!! Great puppy portrait! Your puppy is adorbable. I had to show her picture to our daughter who has a red and white border collie just over a year old. They sure are a smart breed that loves to play ball. She's a beauty, Misty! Merry Christmas. 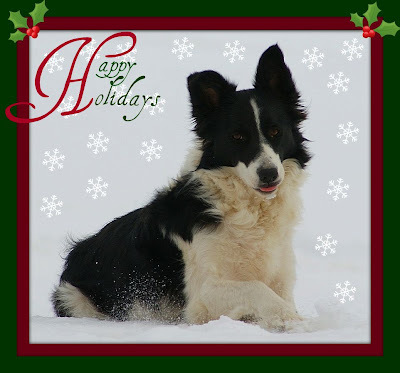 Stay safe and have a wonderful holiday season, Misty. Wonderful photo for your holiday card! Of course our fur-kids remain babies in our hearts forever. Glad you're doing what you need to do to stay warm in these conditions.